You are probably like me and have read a great deal about newly discovered benefits of vitamin D. I was thinking that since Vitamin D is added to margarine all we vegans have to do is eat more vegan margarine . It is sure more healthy than butter that is hydrogenated. Isn't most margarine hydrogenated? I've always heard that the best way to get Vitamin D is from the sun anyways. I had a severe vitamin D deficiency earlier this year (not due to veganism- I was getting laser hair removal and they told me to avoid the sun so I wouldn't get tan and thus burned by the laser). I read that there are two kinds of Vitamin D supplements- D2 & D3. 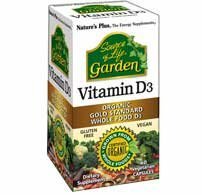 D2 is from plant-based sources but supposedly not that good as a supplement, but D3, which is usually found from animal sources, is the most effective supplement for bringing D levels up. I too am not sure that consuming margarine every day is a good choice. I started using the above brand of vitamin D a month or so ago. My D levels were very healthy when tested in the summer of 2011 as a vegan as I was outside a lot with cycling, running, hiking etc. A year and a half later I had my levels tested again recently and it is still in normal range but went from the 70's to 46. I used to take a D2 ergocalciferol supplement but I had constant headaches and was getting strange skin coloration. When I stopped the D2 supplements that all went away. Regardless, I have osteoporosis (acquired as an omnivore from a number of factors) and I need to make sure my D levels are optimal for absorption of calcium. I really hope this vegan D3 works. I have to break the capsule open and mix the powder in food as my stomach can't handle large pills, but I have not had any side effects so that is a plus. I see on Amazon.com there is also a vegan D3 spray approved by the Vegan Society. One more thing about the vitamin D. It is a fat soluble vitamin so it is important to make sure you are getting enough fat in the diet to absorb it, which is probably why it is added to margarine. But I would still get my fat from whole foods like nuts, seeds, avocado, coconut and not so much from margarines and oils. I'm sorry to hear about your bone issues- that must be so rough. I hope the results come back good and you see some major improvement. As for the Vitamin D..when I got tested at the beginning of the year (I had to get blood tests because I had mono, so I just got everything done at the same time- I had no idea I could have such a deficiency), my Vitamin D was less than 4 (I don't think they could even measure exactly because it was so low), and after 3 months of taking this it was back to normal, so I hope you have good results with this Vegan D3 as well. That spray sounds good too. I didn't know about needing fats to absorb Vitamin D- that's good to know, especially since nowadays everyone is talking about a low-fat whole foods plant-based diet, so it's good to remember to not go overboard and cut out too much good fat. Vitamin D supplements almost always contain stearic acid in sufficient quantities to allow for full absorption. Needing large amounts of fat to absorb fat soluble vitamins is just a nonsense perpetuated by people like the Weston A Price Foundation trying to justify slavering every bit of veg in butter. Thanks Lentils for pointing out about stearic acid allowing for full absorption. I did not know that!